Bibliophiles, this bookstore-slash-library-slash-cafe should be your go-to when you need a cosy setting for some blissful, silent reading. We say either bring your own book, or grab one from their shelves. Then, proceed to order their coffee and muffins, start reading and tune out the outside world. This quaint place is where you should head if you’re in the mood for some deliciously crunchy, thin-crust pizzas from their wood-fired oven. Also thrown into the mix are thick shakes, sandwiches, Lebanese and Chinese dishes. Their Death By Meat and paneer tikka pizza are must-tries. Taste and humour is something Hook has displayed with just their bar menu, which is rife with pop culture references (we love the Cersei Lannister imagery on the wine listing). The decor is fairly typical of lounges, but this is a good option when you want to go out drinking with your buddies. Craving Chinese or Thai food? Make a pit-stop at this outlet of the popular food chain in Indirapuram for some delicious Drums of Heaven, dimsum and Singapore Style Noodles. Located in Raj Nagar, this spacious and well-lit space caught our eye because of its library, a small shelf full of travel gear (you can feel free to buy some, if you like) and a menu inspired by the founders’ travels. We love their watermelon mojito, chicken burger and home-style Maggi. In the mood for a picnic lunch with the fam, but don’t want to be outdoors? This park-themed place is an ideal alternative, complete with artificial flowers, fountains (as a stand-in for waterfalls) and all-green decor. Don’t forget to try their sweet corn soup, corn tikki and paneer lababdar. The place is a great option for chilling with your friends as well as fam. There are different seating options (we personally prefer the bean bags next to the 3D artwork of the Hulk’s punch coming out of the wall) as well as a gaming zone. Try their cheesy fries and the Peshawari chaap. Pop into this pretty place for a date with bae. The wooden furniture, combined with the all-white and minimally-done interiors create a very soothing vibe. Plus, we get excited just thinking of their Kit-Kat shake and the cheesy veg lasagna and nachos. This gorgeous lounge inside the Country Inn and Suites welcomes you with life-sized statues of medieval guards, live music, a sports screen and a gorgeous pool with fountains in it. All this beauty makes up for the fact that it’s veg-only (and on the pricier side). Head here to chill with some drinks on your next evening out. We recommend this one for when you want to hang out with your gang. It’s a chill space with a pool table, Playstation consoles and comfy bean bags to lounge on. With comfort food like their Mac and Cheese Burger, Chicken Tenders, their Oreo shake, grilled chicken sandwiches and Green Apple Mocktail on the menu, it’s a hit with the young crowd. Dog-lovers and pup-owners, there’s no need to head all the way to Delhi for a pet-friendly cafe. 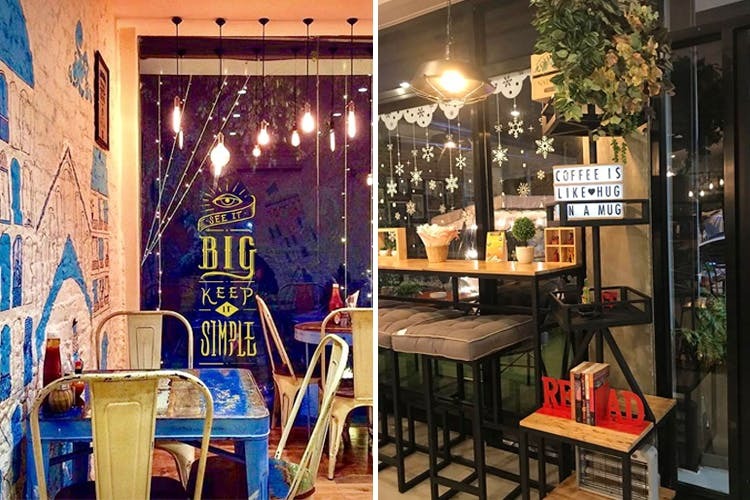 This adorable place has delicious food for both pooches and their hoomans. Plus, they have a play area where you can have a ball with your dog. We hear the Chicken Chow Chow Noodles, peri-peri pizza and the chocolate fudge are a must-try. Another gem from Country Inn and Suites, we recommend this fine-dining restaurant for its delectable (albeit vegetarian) North Indian and Chinjabi food. Also, their decently-priced buffet spreads are definitely worth trying out. Read more about that here.